Following a partially successful Indiegogo campaign, Icarus started shipping their latest 8-inch ereader to customers last month, and they have now also started selling it through Amazon.com for $199. 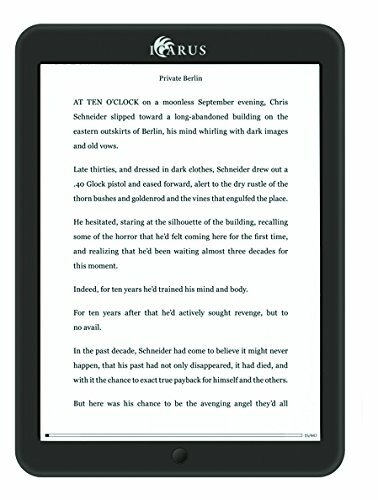 The Illumina XL is an 8" ereader that runs Android 4.2 Jelly Bean on a dual-core 1GHz CPU with 512MB RAM, 8GB internal storage, a microSD card slot, Wifi, and a headphone jack for audio. It's one of only a handful of 8" ereaders to be released, and it's one of an even smaller number of run Android on such a large epaper screen. Its 8" screen has a relatively low resolution of 1024 x 768, and it has both a frontlight and a touchscreen. Thanks to the high price tag there aren't very many reviews yet, but if you head on over to MobileRead you will find a number of people who had bought one either through the Indiegogo campaign or direct from Icarus (one even posted a video). The reviews are generally positive, although pretty much everyone agreed that the so-called "app store" bundled with the device was useless (you'll need to use a trick like this to get apps). There are other complaints which suggest that the Illumina XL's frontlight is about as good as the one on the original Kindle Paperwhite. But on the plus side, several users reported that you can install apps like the Kindle Android app. So if you do get one, the versatility of the large screen plus Android should outweigh the disappointing frontlight. Where did you see reports of the Google play Store successfully installed? All I found say it didn’t work. I wouldn’t want it if you can’t install the play store. Damn. Did I misread the posts? I got really excited about it until I saw that it’s 160ppi. I’m not really a ppi junkie or anything, but the high resolution Paperwhite nearly doubles that resolution, and I’ve always thought that reading is where ppi counts most. Like, I had a first generation iPad mini, and I didn’t mind watching videos on it but couldn’t use it to read. A higher-res screen would have been nice, yes.